Sam says: This slogan (a riff on the Alien tag-line) came to me as I responded to comments on my Facebook post about how useless myspace has become. After staring at it on the page I thought, “Hey, that would make a cool ironic T-shirt!” Unsure if I was just entertaining myself in the vacuum of the internet, I decided to put it to the test at Kickstarter. And it turns out people DID like the idea. 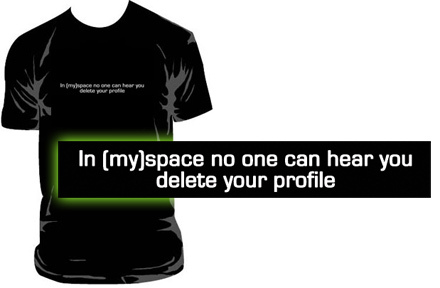 Enough people pledged, to hit the goal and fund the manufacturing of this shirt. Slim-fit black American Apparel shirt with white print.